Millions of Americans use credit cards, but are we getting the best deals we could? For those who confined their search to the major banks that profit from issuing credit cards, the answer is probably not. There's a reason American Express (AXP) has generated more than $14.5 billion from its card services segment over the past 12 months. Credit cards favor banks, especially when you commit to minimum payments on big balances at double-digit interest rates. On Monday, Daily Finance reporter Barbara Thau shared CardRatings' list of the five Worst Credit Cards of 2011 -- plastic to avoid for the sake of your financial health. But there are deals to be had if you look carefully enough. 25 days for purchases. Interest begins accumulating immediately for balance transfers and cash advances. 3% of the balance for each cash advance, though not less than $4 or more than $50. 2% of the value of each foreign transaction. Up to $25 per late payment. Up to $25 for each returned payment. Source: LowCards.com and Simmons First National Bank. 1. Cheap balance transfers. While Discover Financial's (DFS) offer to give applicants 15 months of 0% interest on most balance transfers looks great at first, you'll pay 3% of the balance in fees on day one -- or more than 40% of what Simmons First charges annually in interest. 2. Extended grace period. Many cards now ask that you pay for your bill within 20 days. Simmons First gives good customers 25 days to make good. 3. No annual fee. Need I say more here? Fewer fees means more moola in your pocket. The downside? 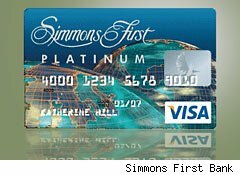 LowCards.com, which named the Simmons First Platinum Visa as one of its best credit cards for 2012, says the bank will only issue this particular brand of plastic to consumers with excellent credit. The terms and conditions don't specify a credit score, but 740 or better is probably a safe bet. Apply for this card if you have (a) excellent credit, and (b) you're looking to transfer a small balance from a high-rate card. The savings will add up quickly if you use extra cash flow to pay off remaining debts. And if you don't? The hit won't be huge because Simmons First is only charging 7.25%, versus 14% for the industry average as of this writing. But seeing as this is a variable rate card, the good times may not last. Know what you're getting, and plan accordingly. Motley Fool contributor Tim Beyers didn't own shares in any of the companies mentioned in this article at the time of publication. Check out Tim's portfolio holdings and past columns. The Motley Fool owns shares of Simmons First National. Motley Fool newsletter services have recommended write a covered strangle position in American Express.